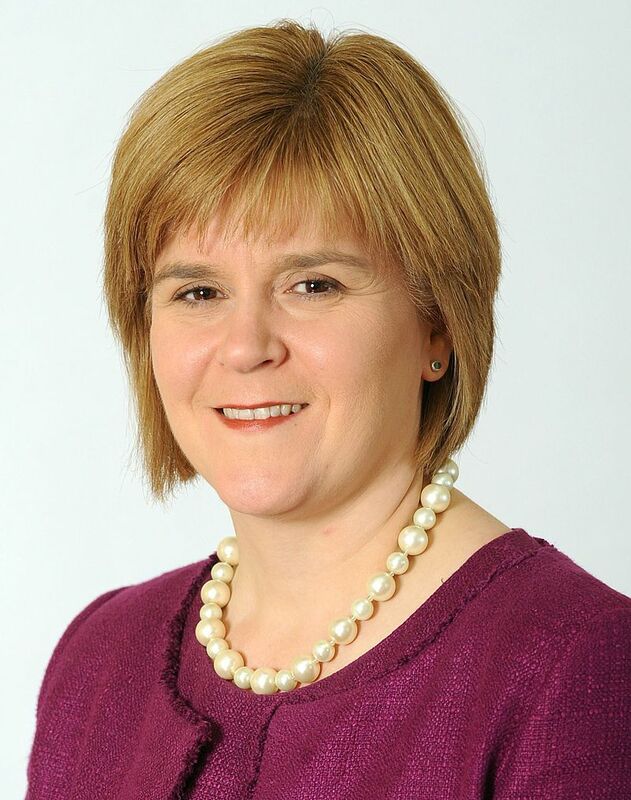 Below is the text of the speech made by Nicola Sturgeon, the Scottish First Minister, at the Jimmy Reid Memorial Lecture held in Glasgow on 24 November 2015. Thank you, Grahame [Smith, General Secretary of the STUC]. You know, I sat quite a few of my university exams in this room. But I don’t think I’ve ever been set a bigger test than to follow what we have just seen. To give a lecture in Jimmy Reid’s honour – in the room, indeed on the very spot, where he delivered, what is undoubtedly the finest political speech in Scotland’s postwar history – is a daunting challenge. It is also of course an enormous privilege. I was privileged to know Jimmy, and it’s a particular honour tonight to speak in the presence of his family. I am grateful to them, and to all of you, for coming here tonight, and to the Jimmy Reid Foundation for organising tonight’s event. I’m going to start with the rectorial address you’ve just listened to – partly because it’s magnificent, but partly also because it’s directly relevant to what I want to talk about tonight. The reason that speech has endured – and you heard it very clearly in that clip – is that Jimmy, above all else, was making a moral case. He was articulating the values which he exemplified throughout his entire life. He argued that humans are essentially social beings. We flourish through contact, conversation, the contribution we make to each other and to our wider society. And so when people sign up to the values of a rat-race, when they allow themselves to be blinded to the misfortunes of others. And also, when things are done to people – when they are told they are expendable, or feel excluded from decision-making – it doesn’t simply cut their income. It corrodes their soul and diminishes their sense of self. So the basic principle of empowerment – through respect for individual dignity, and encouragement of individual potential – is at the core of what I want to talk about tonight. The title of this speech is that worker’s rights are human rights. I’ll spend some time looking at the UK Government’s Trade Union Bill – since it’s such an extraordinary and unwarranted assault on some of the social and economic rights we value and have come to take for granted. I’ll then make a broader case about rights; about our duty to recognise and cherish the value, dignity and potential of every individual in our society – and the fact that when we fail to do so, we don’t just harm those individuals, but diminish our society as well. But I want to start with some immediate context. Tomorrow, the Chancellor of the Exchequer will announce the results of the UK government’s spending review. He has a chance – possibly the final chance – to accept austerity is not a necessity, to change course on some potentially catastrophic decisions. For example, if all of the UK Government’s proposed tax credit changes are implemented, around 200,000 families with children in Scotland stand to lose an average of approximately £3000 a year. More than three quarters of the families who receive tax credits have at least one person who works. The cuts are directly targeted at working people on low incomes and their children. They hurt many of the people we most need to help. I call, again tonight, on the Chancellor to reverse his decision to cut tax credits when he has the opportunity to do so tomorrow. If he doesn’t do so, the Scottish Government will set out proposals to protect the incomes of low paid families in our budget in December. Obviously, the substance of the Chancellor’s proposals on tax credits is of greatest concern, but the process is deeply damaging too. There was no consultation before the Chancellor announced these cuts in June and no mention of them in the Conservative manifesto. The decision was taken behind closed doors with no opportunity for people to vote against it, and the full implications and will be made clear to families in letters around Christmas time. This is something which is being done to people – to working families and their children – with no opportunity for meaningful debate or discussion, or for them to influence their own destiny. If you reflect on the opening of Jimmy Reid’s rectorial address– its evocation of “the despair and hopelessness that pervades people who feel with justification that they have no real say in shaping or determining their own destinies” – it’s hard to avoid the conclusion that UK Government policy is not tackling alienation, it is breeding alienation. The tax credit cuts; the bedroom tax; the way in which budgets in recent years have impacted most negatively on women, those on low incomes and people with disabilities – These are things which are being done to the least powerful in our society, by a Government which too often seems oblivious to the consequences. And they are now being accompanied by other measures which seem set to strike at basic and fundamental rights – protections which are most valuable, for people who are at their most vulnerable. The proposal to abolish the Human Rights Act is one deeply regressive step; the Trade Union Bill is another. When Jimmy Reid spoke here in April 1972, it was towards the end of the Upper Clyde Shipworkers dispute. The work-in Jimmy helped to organise was arguably – in fact, in my view, unarguably – the greatest achievement of the post war union movement in Scotland. It asserted the fundamental right of individuals to work. It did so through a peaceful, positive, optimistic, uplifting protest which captured the imagination of people at home and around the world. It stands as an enduring example of how trade unions empower people; of how they provide a voice for those who might otherwise go unheard. The right to strike is an essential part of that, but the real value of trade unions goes much further. They help employers to create the safe, humane, productive working conditions which head off industrial disputes – and which build better businesses. Because of that, trade unions are a force for good in modern society. That’s certainly been our experience in Scotland. Industrial relations here are strong. The number of working days lost due to strikes has declined by 84% since 2007- that’s the highest reduction anywhere in the UK. Last year, fewer days were lost in Scotland, relative to our working population, than in any other part of the UK. And so the UK Government’s proposed Trade Union Bill is based on a worldview we simply don’t recognise. It sees the relationship between employers and unions as one of conflict rather than co-operation. It does not reflect public opinion here, or the reality of industrial relations either. It offers illiberal solutions to a problem which simply doesn’t exist in Scotland. And it makes an overwhelming case – one which both the Scottish government and the STUC made last year – for trade union law to be devolved to our own democratically elected parliament in Scotland. After all, that Bill doesn’t contain a single proposal, in my view, which would ever be passed by the current Scottish Parliament. In fact, in a debate two weeks ago, the Scottish Parliament disagreed with the bill by 104 votes to 14. It’s worth looking at some of the measures. The UK Government wants the right to restrict facility time. Facility time means that employees can spend time carrying out union duties – helping employees at disciplinary hearings, offering training, or meeting employers. It’s a vital part of partnership working, it is the embodiment of how we do industrial relations – it’s not an abuse which needs to be controlled. The UK Government also advocates a ban on public sector employers using “check off” facilities – that’s the payroll mechanism which enables union membership subscriptions to be deducted at source. Now the Scottish Government, as an employer, has been operating a check-off facility for years. The costs are so minimal that we have never charged unions for it. The UK Government intends to make our actions illegal. It’s maybe worth repeating that. The UK Government doesn’t want to stop using check-off procedures themselves; it wants to make them illegal for the Scottish Government to use. It’s an extraordinary and completely unacceptable attempt to control how we act as an employer. It demonstrates that fundamentally, the UK Government wants to discourage union membership. The provision has no other conceivable purpose. The UK Government also wants the power to call in agency workers to take over the duties of people who go on strike. And it has consulted on the proposal that picket leaders should wear armbands or identification tags – a proposal that quite frankly borders on the sinister. Liberty has pointed out that this provision increases the chances of blacklisting – something which has been a very real and recent danger for union members. The UK Government’s own Regulatory Policy Committee has pointed out that key consultation proposals aren’t backed by any supporting data. The entire Bill is driven by dogma and ideology rather than being underpinned by evidence. That’s why the Scottish Government is part of a broad coalition – among the devolved administrations, the trade unions and wider civic society – we are, and will continue to be vigorously opposing the Bill. We have argued for it to be voted down at Westminster. We have proposed that Scotland should be exempted from its provisions. And since the Bill will have a significant impact on Scotland – including on how the Scottish Government as an employer carries out devolved functions – we will argue that it should only apply to Scotland if legislative consent is given by the Scottish Parliament. It is almost impossible to imagine that such consent would ever be granted. We will do everything in our power to frustrate this Bill. Finally, if the Bill is passed, and its provisions do apply to Scotland, the Scottish Government will not willingly co-operate with it. We will seek to do everything we can to continue the good workplace practices that the Bill attacks. Indeed, I can pledge categorically tonight that we would never employ agency workers in the event of industrial action in the Scottish Government. But in addition to opposing this Bill we want to do something much more positive. We want to exemplify here in Scotland that there is a better way of conducting industrial relations; one which is based on a different vision of society. After all, there’s a fundamental contradiction in the UK Government’s approach. The UK Government claims to want a high-wage/high-productivity economy. But if you genuinely want to bring that about, hostility to union membership makes no sense. It’s maybe worth looking at West Germany after the war. It developed what became known as Rhine capitalism. It was based on a strong sense of partnership between workers, trade unions, businesses and the public sector. Rhine Capitalism encouraged competitive markets, but combined them with strong social protections. As a result, the German economy has been characterised by innovation, high productivity and strong exports. That approach to the economy was based on a distinct vision of society. Article 1 of postwar Germany’s constitution places human dignity as the underpinning principle of the entire state. That feeds into concepts such as the constitutional principle of the “social state” – a state which strives for social justice. What we’re aiming to create in Scotland isn’t identical, of course – this is a different time and context. But the core principles are very similar – they’re based on human dignity, value and potential. We have put a commitment to inclusive growth at the heart of our economic strategy. We reject the idea that a strong economy and a fair society are competing objectives. Instead, we recognise them as mutually supportive. Of course we need a strong economy to fund the public services we value so highly. But it is just as true that a more equal society, where everyone can participate to their full potential, will lead to a stronger and more sustainable economy. And workers who are well educated and trained, well paid and highly valued and supported, will be more productive than those who aren’t. That is the principle driving our Fair Work Convention that was established earlier this year. It’s a partnership between Government, unions, employers and employees. It aims to promote productivity in a way that ensures that companies and employees all benefit. We’ve also established the Scottish Business Pledge for companies that openly embrace those values to show public leadership and commitment. More than 150 companies in Scotland have signed up. And we are championing the real living wage – last year there were only 34 living wage accredited employers in Scotland, now there are 400, and that number is growing. We have also published new procurement guidance which explicitly recognises fair work – including payment of the living wage – as important considerations when we decide how public sector contracts are awarded. Now, these are just beginnings – but they are very important beginnings. We’re starting to use the influence and purchasing power of government to send a clear signal. Progressive employment practices are something to be celebrated – not simply because they’re good in themselves, though they are, but also because they contribute to long-term economic and business success. And of course the basic principle that applies to businesses – that they prosper when their people are valued and empowered – also applies to society as a whole. Many of you will remember Jimmy Reid’s memorial service. Billy Connolly was one of the speakers, and told a story about going for walks with Jimmy in Govan when they were young. This was probably in the late 1950s or early 1960s. It resonated particularly strongly with me because many of the streets they walked are streets I now represent in parliament. Getting people to see that glimmer, and kindling it into a spark or fire of ambition, and then enabling them to realise that ambition – that is one of the key challenges today for government and for wider society. Indeed, if you were to ask me to sum up what I consider to be my mission as First Minister, assuming I am re-elected next May, it would be that – the mission of making real progress towards genuine equality of opportunity It will require sustained work to tackle intergenerational poverty. That’s why I’ve appointed an independent adviser on poverty – to advise and, more importantly, challenge my government to subject all of our policies to the test of whether they help tackle poverty. It’s also why our commitment to transformative, high quality and universally available childcare; and our determination to close the attainment gap at school; and our work to ensure that more children from deprived areas get to university are such important priorities for this government. But helping everyone to realise their potential, creating a society in which the determinants of an individual’s success are their own talents and their capacity for hard work, not the accident of their birth or their family background – that will also require sustained work to overturn stereotypes and challenge assumptions. Last week I went to two events, one after another – one relating to digital skills, and another relating to childcare. Both are hugely important – we will need thousands more digital specialists in our workforce every year for the next decade, and we will also need many more childcare workers. But if we proceed as we always have done – 80% of the new digital workers will be men, and more than 90% of the child care workers will be women. It would be wrong to proceed as we have done. That’s why I put such emphasis on gender equality and the need to tackle gender stereotypes. Similarly, we know we need many more doctors over the coming years. But if we proceed as we have in the past, only 1 in 20 will come from the most disadvantaged areas, rather than the 1 in 5 that equality of opportunity would demand. That’s why the work I’ve put in train through the Commission for Widening Access to university is so important. Because the facts that I have just cited don’t reflect the real talents of people in Scotland – instead, they reflect social circumstance and entrenched assumption. And the truth is this – we simply can’t afford as a society, morally or economically, to squander so much of our talent. The price is too high. I was incredibly fortunate when I was growing up, to have parents who instilled an absolute belief that if I wanted to, had the ability and worked hard enough, I could go to university and achieve my dreams. I’m all too aware that too many people still – more than 30 years later – aren’t that fortunate. So there’s a responsibility on all of us to encourage each other’s ambitions, and also to vigorously challenge society’s barriers and stereotypes. And there’s a particular obligation for Government in everything we have responsibility for – whether it’s – support for pregnant mothers, or care for older people; tackling the inequities in our education system ; reducing reoffending, or developing a new welfare system; promoting equal marriage rights, or resettling refugees. There is an fundamental human right and an obligation to demonstrate that we value the dignity and recognise the potential of every individual. It’s an important part of empowering our people and our communities. One of the things which came to define the referendum debate last year was not just a desire, but a yearning, for a better society – not just a more prosperous society, but also a fairer one country as well. That wasn’t confined to those who voted yes – it was shared across the entire country. And one of the things which also changed last year was that we all got to see that alternative futures for Scotland are possible. As a nation we could see what every individual would ideally know from birth – that we control our own fate; that with hard work, the sky is the limit. That older people receive the support and care they need to live with security and dignity. That is the society we should be striving for. Jimmy Reid rejected a society where human beings are told that they are expendable; where ordinary people are excluded from the forces of decision-making; where people feel themselves to be victims of forces beyond their control. We must reject a society where workers’ rights are derided; where inequality is unchecked; where working families wait to get letters telling them their income is being cut by thousands of pounds. Instead, we can build a better society, based on respecting rights, recognising dignity and encouraging and, crucially, enabling each other’s potential. None shall let another fall. The verse represents the antithesis of the rat race Jimmy Reid rejected. Its vision – of individuals making progress through solidarity – is the one which he worked towards throughout his life. My hope is that we in Scotland can make much more progress towards it in the years ahead. If we do, we will live in a wealthier, fairer, better nation. And we will have built a fitting memorial to the wonderful, inspiring and challenging legacy of the great and irreplaceable Jimmy Reid.